It’s finally October, aka Halloween month for those spooky enthusiasts out there. If you’re looking for Halloween themed fun in Orange County but don’t know where to go look no further. Here’s our list of events in and throughout October to help you have a really spooky month. Oct. 14, 11 a.m.-6 p.m.
For fans of flea markets and of Halloween this is the perfect place for you to visit. Over 20 vendors attend the fair, selling things such as handmade jewelry, candles, oils, baked goods and many Halloween themed items like creepy bath bombs. There’s also Halloween themed activities like face painting and henna tattoos. Sept. 29-Oct. 28, Saturdays and Sundays 10:30 a.m.-5 p.m., Weekdays 8 a.m.-6 p.m.
Maples Farm puts on an annual Halloween Festival with plenty haunted entertainment to fulfill your spooky needs. Take the haunted hayride, go through the haunted barn, and traverse the haunted hay maze. In-between your adventures, stop to hang out with the farm animals and buy some seasonal treats. Sept. 28-30, Oct. 4-31; 6:30 p.m.-10:30 p.m. Imagine pumpkin carving art, but much more extreme: that’s The Great Jack O’ Lantern Blaze. This event features more than 7,000 jack o’ lanterns all hand carved by a team of artisans, arranged and illuminated into pieces such as a pumpkin carousel, the pumpkin zee bridge, and a pumpkin windmill. Synchronized lighting and an original soundtrack round out the event. Oct. 5-28, Fridays & Saturdays 7 p.m.-11 p.m., Sundays 7 p.m.-9 p.m. If you want to be thoroughly scared you’ve found the right destination. TerrorDome lives up to its name with three main attractions of the Barn of Terror, Zombie Tag, the Backwoods and the Grounds. The Barn of Terror is a turn of the century haunted house experience, Zombie Tag is tag but with a deadly zombie army as the person who’s it, and the backwoods is a slasher film experience. Oct. 13-27, Saturdays and Sundays 7 p.m.-10 p.m.
Pierson’s Farm is an average pig and cow farm, until Halloween rolls around. Then, Pierson’s turns into a spooky wonderland, with their barn, corn maze and hay trail turning into haunted attractions. 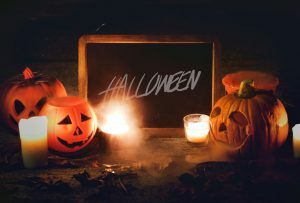 Weekends in October, Saturdays 10 a.m.-4 p.m., Sundays 11 a.m.-3 p.m.
With a haunted trail to start up the fear and a haunted house to finish the scares, Halloween at Devitt’s is something to remember. After you’re scared you can stop by the straw maze, take a train ride, and paint a pumpkin for a little ‘vanilla’ Halloween fun.